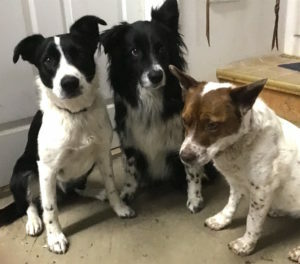 I’m servant to three, highly energetic, mixed-breed-but-mostly herding dogs: Peeko, a heeler mutt; Kip, a mostly Aussie girl; and Monty, a mostly border collie boy. Together, we trek between two and ten miles every day. We walk, run, and ride almost entirely off leash and my call or whistle keeps them close. But how to keep track of the dogs at night when darkness means they might be right behind me or bounding up the next hill? 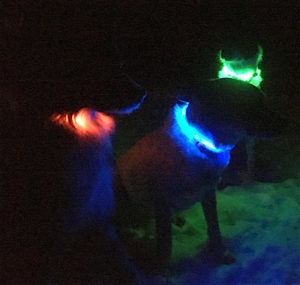 Enter the NiteHowl LED Safety Necklace, by Nite Ize, a Boulder, Colorado company. 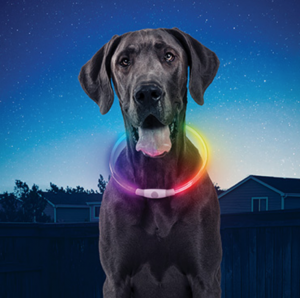 The NiteHowl makes monitoring your dogs’ night movements fun and entertaining. We tried the Safety Necklaces in three different colors (super handy for identifying individual dogs), red, green, and blue. The dogs went about romping and racing, seeming not to care about the device. I easily followed their movements with great amusement. Darkness challenges solved! Nite Ize recently upped their game by offering rechargeable LED necklaces. Even better, I say. Each necklace can be switched to one of three colors (or switch it to cycle through the colors for extra fun) and trimmed to fit each dog, like the original NiteHowl. 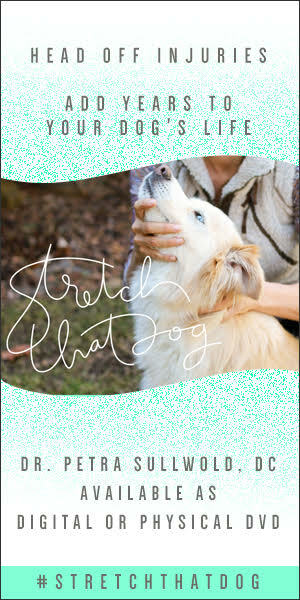 Thankfully, the freak-your-dog-out flashing mode is gone. Recharge it easily with a micro USB cord. That’s not included but is likely the same cord you use to charge your cell phone. Just 20 bucks here. Posted in Dogs and Horses, Gear and tagged Nite Ize.